I wanted to make sure you saw my recent op-ed on my work to protect New Jersey's coast from offshore drilling. by Congressman Frank Pallone, Jr.
During his campaign and Inaugural Address, President Donald J. Trump repeatedly claimed that he was on the side of “the forgotten men and women of our country.” However, his first year in office is proof that, despite his words, the President and his Administration are committed to serving the needs of corporate interests, regardless of the impact on everyday Americans. Nowhere is this more clear than in the Administration’s recent proposals to dramatically increase offshore drilling while rolling back safety regulations put in place after the catastrophic BP Deepwater Horizon explosion. These decisions are clearly designed to benefit Big Oil at the expense of coastal communities. Last week, the Department of the Interior released its draft proposal to allow offshore drilling in essentially all U.S. waters, including the Atlantic Ocean. 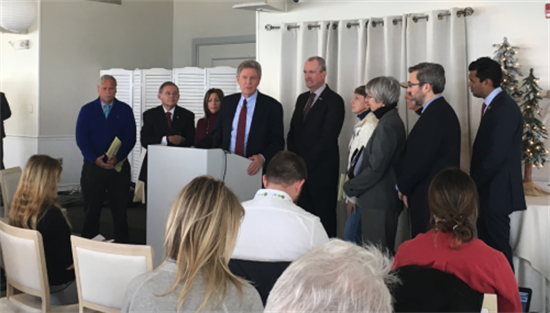 In New Jersey, we have long had bipartisan consensus that drilling offshore threatens workers, families, and businesses up and down the coast. The Jersey Shore, which runs through my Congressional district, is a national treasure, and plays a huge role in powering New Jersey’s economy, adding $45 billion of economic activity to the state. The Shore helps employ nearly 10% of New Jersey’s workforce via the tourism industry, including 65,000 New Jerseyans working in the state’s recreational and commercial fishing industries, and there are also countless home- and business- owners who have made lives for themselves along the Shore. Additionally, allowing oil and gas development in the Atlantic would not meet any immediate energy needs, and it is, at best, unclear that doing so would be an energy boon. Simply put, drilling in the Atlantic is not acceptable. Beyond New Jersey, coastal communities and citizens throughout the country are rallying in opposition to this plan. New drilling leases have not been allowed in the Pacific for decades. Floridians have long sought to protect the Eastern Gulf of Mexico from drilling, in order to protect their own beaches and coastal economies. The Arctic Ocean has long been recognized as a place where an oil spill would be ecologically catastrophic. The Obama Administration recognized the widespread, grassroots opposition to drilling in all of these areas and the Atlantic when it maintained protections against offshore drilling. The Trump Administration proposal puts all of this at risk. An oil spill is an inevitability, not a possibility, if drilling occurs off of our coast. While the American people know it’s not worth the certain damage, the Trump Administration is fine with local communities facing a crippling spill as long as corporate oil interests can line their pockets. Then, to double down on its gambling of coastal economies, the Trump Administration has also announced that it intends to weaken oil rig safety regulations, including rules developed after the Deepwater Horizon explosion. One of the targeted rules simply requires third-party inspections of safety equipment - hardly job-killing government overreach. There have also been media reports that the Administration intends to weaken the well control rule, which was developed to prevent future explosions on oil rigs. Whether it is healthcare, net neutrality, taxes, or our most beautiful and important lands and waters, the Trump Administration is firmly on the side of corporate interests, and against those of everyday working Americans. For the Atlantic alone, Oceana, an organization devoted to protecting our oceans, has found that over 140 East Coast municipalities, more than 1,200 local, state and federal elected officials, a coalition of over 41,000 businesses, and hundreds of thousands of fishing families all oppose offshore drilling in the Atlantic. That does not include the innumerable number of parents who take their children down the Shore each year, where they play on safe, beautiful beaches. Pallone represents New Jersey’s 6th District and is ranking member of the House Energy and Commerce Committee.